Ask fellow campers about "North Sandusky Campground COE" and nearby attractions. Nice, quiet park with plenty of room to explore. There is a long bike trail, over 20 miles. It is about 1 mile to South Sandusky Campground along the trail which also features a small beach area. Has clean bathrooms with flush toilets rather than the standard pit type in Illinois parks. There are also showers which are kept clean. Our loop (White Oak) had 4 showers. I did not have a tow vehicle, but the driveway was long enough for a long RV and probably one or two more vehicles. We camped at North Sandusky Campground COE in a Motorhome. Buy firewood on the way in, there is nowhere to get it in the campground other than collecting it. Nice campground. Large spaces between the sites. Roads are good, a couple of the turnaround circles are tight but ok. Rules say no parking on grass but it wasn't enforced. Quiet at night. We will return. We camped at North Sandusky Campground COE in a Travel Trailer. Nicely spaced mostly shady sites, asphalt pads, it seems the concrete picnic table is on the dirt at most sites. Some full hookup sites, most are electric only, so you must fill water at CG dump station, though spigots are located throughout the grounds. Sites are mostly level, but some waterfront ones may have a bit of a grade - saw several trailers with many blocks under the rear end and the tongue nearly on the asphalt. Electricity was always 124- 126 V. The maintenance contractor is a good one; fire pits are cleaned and the grounds are mowed often. The restrooms and shower house are some of the cleanest I've seen, the shower house has epoxy floors, although shower pressure isn't all that great. The boat launch and picnic area are close by. We camped at North Sandusky Campground COE in a Travel Trailer. These campgrounds are beautiful! There are 5 or 6 on Rend Lake. The spaces were laid out so that you aren't staring at someone elses camper out your front window. 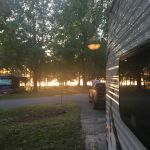 We camped at North Sandusky Campground COE in a Travel Trailer. The COE visitors center is quite interesting. Judging from the number of fishermen along the lake, it is quite the fishing spot. Our rate reflects the golden access discount. 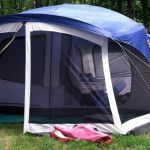 This is a popular campground with many retirees staying the full 14 days. Some of the sites are waterfront, and reserved well in advance. There are 2 shower houses, the one closest to the fee booth is the one we used, and very modern, clean and immaculate. We checked out the other one and it was rather skanky. We really enjoyed riding the bike trail-- rode down to the South Sandusky Campground, the beach and the marina. The bike trail wound through the woods on nice new, smooth cement. We enjoyed our stay immensely and will return. We camped at North Sandusky Campground COE in a Motorhome. 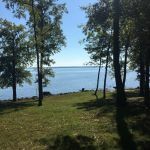 Several lake front sites available; near a large, beautiful public beach. If staying in the Hickory or White Oak sections, beware that the main bathroom facilities are over a mile away. Excellent biking trail to South Sandusky Campground and on down to the beach. Make reservations well ahead of time for weekends, many sites will fill up with campers and boats / boat trailers for the water recreation. We camped at North Sandusky Campground COE in a Travel Trailer. Park shows signs of wear and not as well kept as we have experienced at other COE grounds. Restroom very dated, no lighting, excessive leaves, limbs, muddy entrance to site. Probably a result of the stormy spring but still on the edge as far as being an attractive place to camp. Won't return. Plenty of shade and nice lakeside view. Full hookup @ $12 with/Golden Age access was hard to beat. Tried to get a site w/SW clearance for satellite. The lady assigning sites said she did not know South from East. Only here two days, so ended up with no satellite. Dinner at Windows restaurant at the State Park Lodge was a very good meal. We camped at North Sandusky Campground COE in a Fifth Wheel. Rend lake is the first Corps of Engineer campground that we have stayed in. Our site was right on the lake and it was beautiful. This was a very well-maintained campground. It has a very nice bike trail (paved) that was completed in 2005. We would definitely stay here again if we are in the area. We camped at North Sandusky Campground COE in a Fifth Wheel. Are you affiliated with North Sandusky Campground COE ?